Changing Opinions On Saudi War: Coincidence or Conspiracy? Last month I predicted that Army is playing Nawaz for a fool on the Yemen crisis. At the time, I wrote that “If Pakistan joins a Saudi attack on Yemen and it goes well, Gen Raheel will be celebrated as a hero of Pakistan and the Ummah. If Pakistan decides not to participate, it will be Gen Raheel seen as injecting sense into a belligerent Nawaz.” As we know, Parliament backed neutrality in the conflict, a sensible position supported by most Pakistanis, though sparking vocal anger from Arab allies. Parliament has been praised for its sensibility and courage in taking a tough decision that is in Pakistan’s best interest, but there are signs that certain forces are acting behind the scenes to change this. Hyper-nationalist Army pitthoos like Ahmed Quraishi have been trying hard to whip up pro-war sentiments. Parliament’s resolution on #Yemen should be archived. #Pak must join #DecisiveStorm, stand by our #Gulf allies in their hour of need. This suggests that there could be at least a certain element within security forces that is determined to join Saudi’s war, but keeping in mind that Ahmed Quraishi has a history of doing paid propaganda for Arab governments and generally lacking any credibility, it is easily dismissed as any serious effort to change the wind’s direction. More interesting was watching how certain more respected defence analysts made quick about-faces. Ejaz Haider took a very strong position against getting involved in any way Saudi’s war, terming the idea “stupidity at its most stupid”. However only four days later, he made a complete U-turn, declaring in the same magazine that “those who suggest that Pakistan should stay out of this do not realize that that, while being the ideal course, is not entirely practical.” For anyone who has ever worked in media, it is not hard to imagine the phone call received after his first piece was published. Other defence analysts with close ties to top military brass, including the owner of Pakistan’s own “Black Water” mercenary force, are also now beating the pro-war drum. There is another element that is working hard to whip up pro-war sentiments, too, and this one is much closer to the ground. Humanitarian group and ambulance service Jamaat-ud-Dawa has been working day and night to shift public opinion in favor of sending Pakistan Army to do Saudi’s bidding in Yemen. JuD is accepted to have backing of at least certain corners within Army and ISI, and has been an effective force in whipping up public sentiments useful to Army negotiating such as anti-Americanism and anti-drone protests even while Army was secretly begging US for more drone strikes. 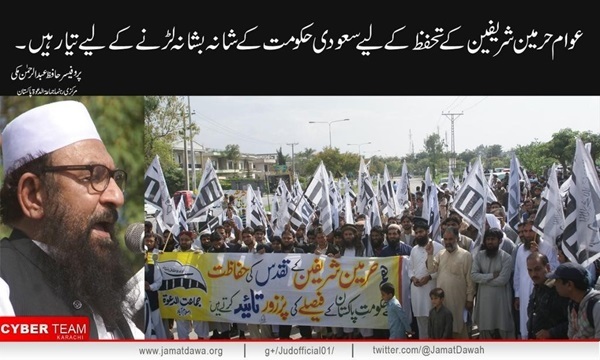 JuD’s effectiveness comes from its religious credentials which lend it a certain credibility among the common man. Understanding this, JuD has been working to turn Pakistan’s involvement in the Yemen crisis into a religious obligation, even though this threatens to send the country even deeper into sectarian disaster. Public sentiment against getting sucked into Saudi’s war and the neutrality resolution that reflected this happened quickly: Perhaps more quickly than could be managed. Already there are signs that the wind is changing directions, though and Pakistan is getting more involved in Saudi’s military campaign than the public desired. As we saw with Ejaz Haider, opinions on national security matters can change (or be changed) quickly. Whether or not Pakistan is able to remain neutral in this foreign war, only time will tell. What will probably never be known is whether changing opinions are ther result of coincidence or conspiracy. Whatever happens, though, it is hard to to believe that Army is working behind the scenes to create a narrative in which they are responsible for any success, but not accountable for any disaster. This entry was posted in Blogs and tagged Ejaz Haider, Ikram Sehgal, isi, Jamaat-ud-Dawa, JuD, Nawaz Sharif, Saudi Arabia, Yemen by Mahmood Adeel. Bookmark the permalink.